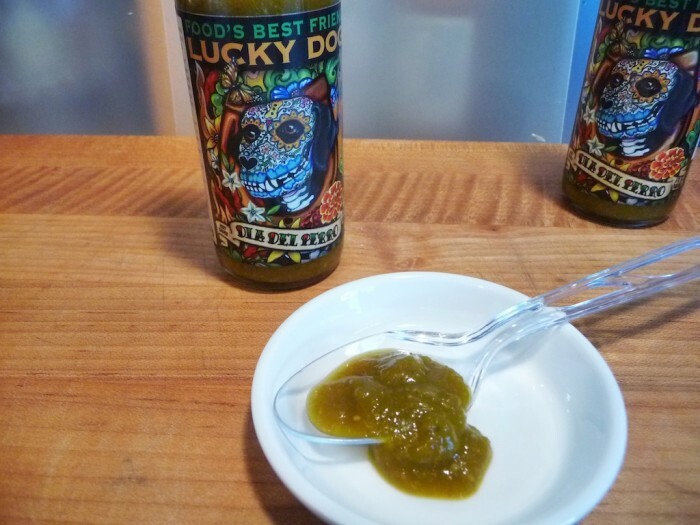 Dia del Perro, or “Day of the Dog” is a new salsa verde style hot sauce from the award-winning Lucky Dog Hot Sauce kitchen. 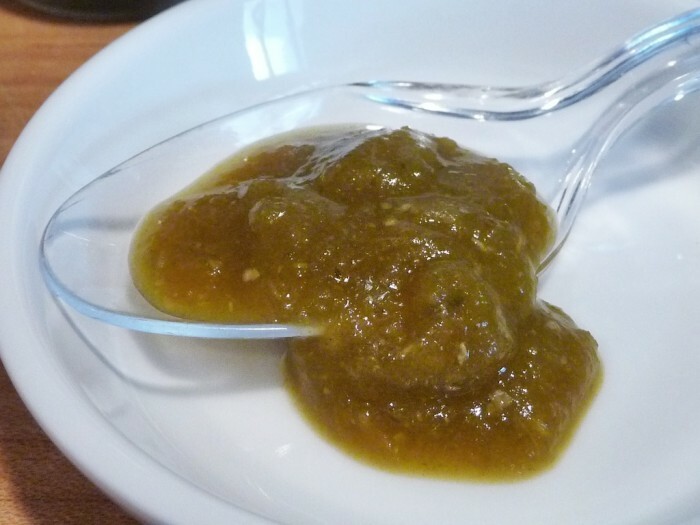 This is no ordinary salsa verde (green sauce). Using serrano peppers, tomatillos, roasted garlic, and even chile tepin (bird’s eye), creator Scott Zalkind adds his own signature flavor by smoking his sea salt with alderwood and toasted onion, and infusing that with habanero peppers. The result is a complex and flavorful sauce. 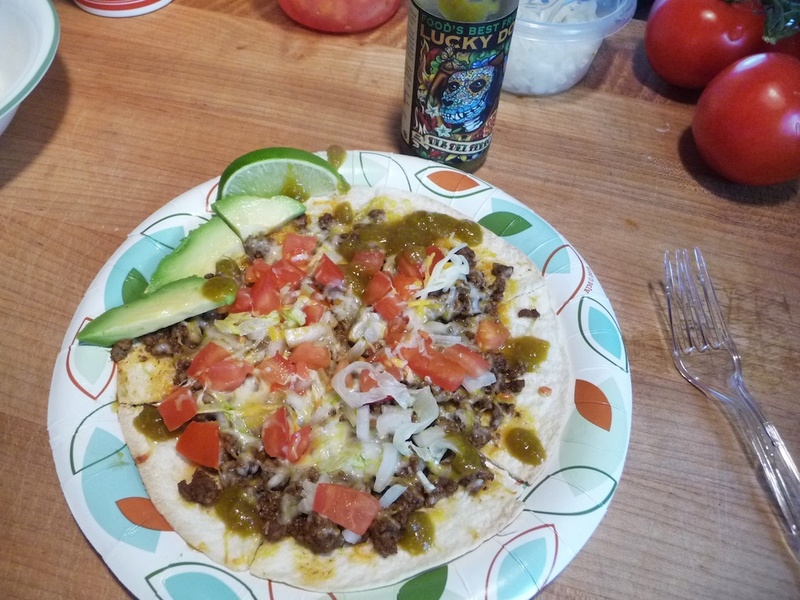 Scott says this is his “tribute to the taqueria-style verde table sauces of California and Mexico”. We think he nailed it. Heat Level: A mild-medium heat that everyone will love. Overall Rating: Superb flavor! Best of the best! Ingredients: apple cider vinegar, organic apple sauce, serrano peppers, onions, roasted garlic, carrot juice, water, sea salt (alderwood smoked, toasted onion and habanero infused), dried tomatillos, carrots, lime juice concentrate, chile tepin. 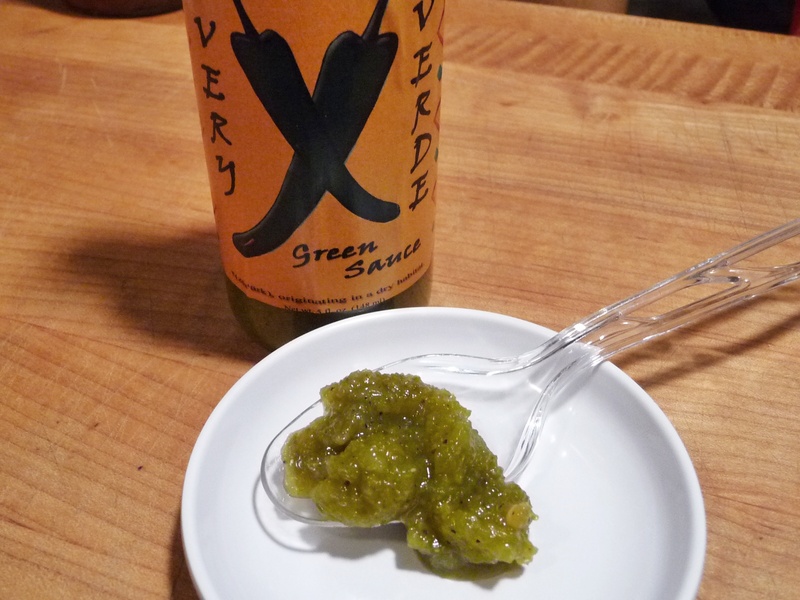 Texture & Appearance: Very thick, and very pulpy, this olive green sauce takes some coaxing to get out of the bottle. Once you get things started, the sauce pours a little easier. The pulpy texture makes for a great “mouth feel”. Satisfying. Taste Straight Up: We smell the vinegar and “green” flavors up front, but surprisingly, the vinegar taste is not overbearing. Even the lime flavor is muted – a good thing for us, as we don’t care for verde sauces that have too much tang from the lime and/or vinegars. And I already mentioned the pulp provides a nice mouth feel, which only adds to the taste experience. 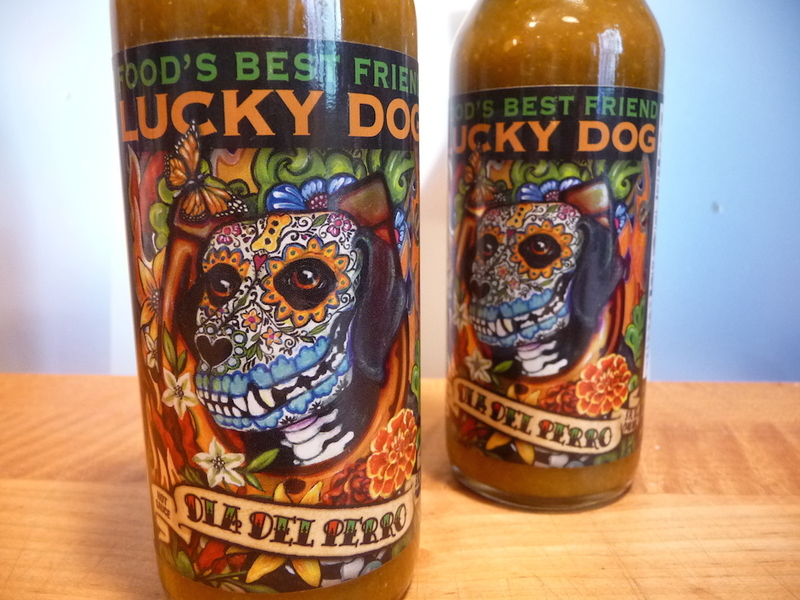 Finally, I want to point out what we perceive as the classic Lucky Dog Hot Sauce signature flavor component – and that is the smoked sea salt. Infusing his sea salt with various woods and veggies and peppers is tantamount to sheer genius. And we don’t know of any other sauce maker that takes this step to round out their recipe or sauce in such a unique way. We feel this step alone sets Lucky Dog Hot Sauces and specifically the new Dia del Perro sauce in a class all its own. Distinctive. Heat Level: – The slight burn is a bit “sting-y” as Marilyn puts it – probably from the contribution the chile tepin peppers add at the very end of ingredients. I disagree with the “sting-y” description. I find the overall heat level is simply “warm” – very middle of the road. Reliable. Label/Graphics: With a unique departure from the usual look of his labels, Scott enlisted artist Robin Case for the “sugar skull” graphic that adorns this bottle. Familiar, as it’s still his beloved black lab Lucky as the model, yet artsy-fartsy. Bonus: if you’re in California, it’s available as a tattoo. Contact Scott for details. Impressive. 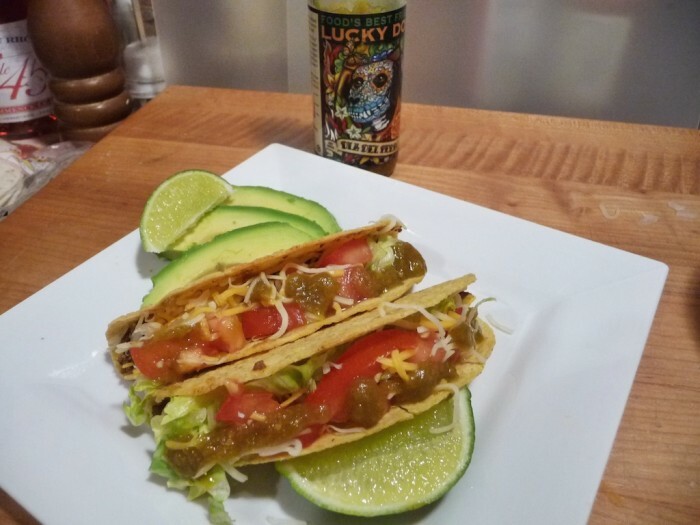 Tacos: We cooked up a big batch of Tacos using our homemade taco seasoning, and just went nuts pouring Dia del Perro sauce onto them. The fresh flavor of Dia del Perro was very complimentary. It blended well with the spicy meat, crispy tacos, and sour cream. Winner. Flour Tostadas: Again, the sauce rocked on these. The Flour Tostadas almost gave us a better picture of the sauce. We could really taste the flavors of the Dia del Perro on our Flour Tostadas, even more than on the tacos from the night before. If you want to know how to make these, just shoot us an email or use the Contact Us menu. Fresh and bold. Tell Scott that HotSauceDaily sent you!